The one and only Kinder Surprise Eggs. 24 x 20grams. 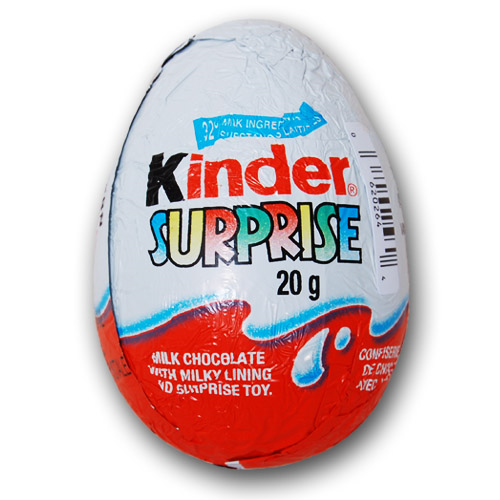 Milk chocolate with milky lining and surprise Toy inside. Imported by Ferrero Canada Ltd. INGREDIENTS : Exterior: milk chocolate (sugar, milk powder, cocoa butter, cocoa mass, soy lecithin, vanillin). INTERIOR: Milk powder, sugar, modified oils: (vegetable oil & Palm Oil), soy lecitihin, vanillin, 32% MILK INGREDIENTS WARNING: Toy not Suitable for Children under 3 years. Small parts might be swallowed or inhaled. Adult supervision recommended.